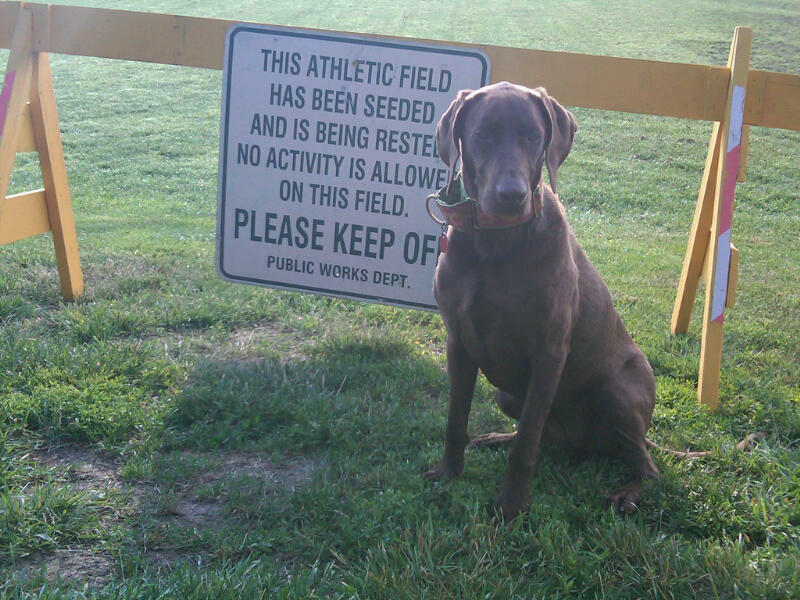 On the Summer Solstice, the large field in the off-leash area was freshly posted with its "keep off" signs. The field has been re-seeded to recover from soccer and other sports that were scheduled on the field all through the spring. It is a picturesque spot to watch a sport being played, but Athena will miss the games of tag which are often played there with her four-legged friends. Luckily, Fort Williams is a large, beautiful place to play and spend time with people, and with pets. even in the early morning, the shadows were strong and the walkways near the lighthouse were very enjoyable. 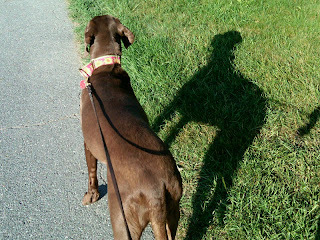 Athena is getting better and better on the leash, though off-leash, galloping is still her favorite mode. Clyde is a "Marmaduke-like" puppy who Athena loves to play with at the park. 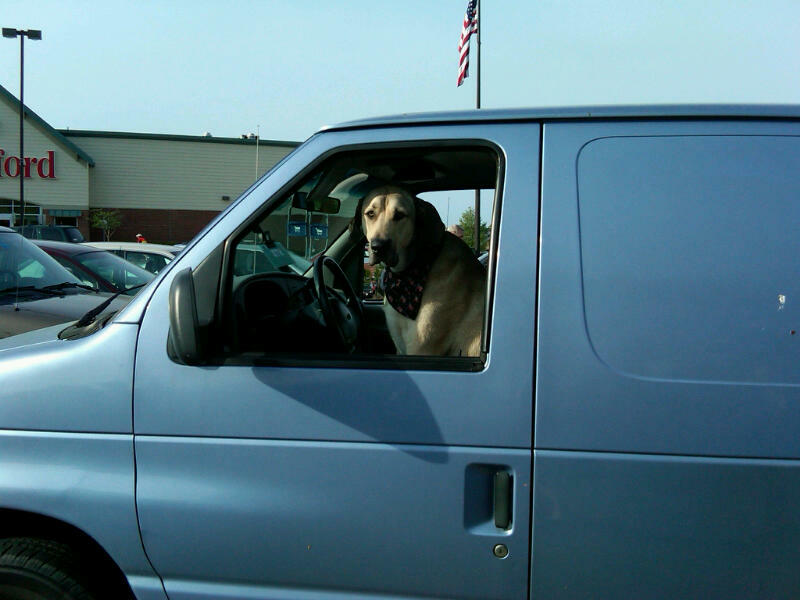 On the way home from work recently, I saw him sitting in the grocery store parking lot (I hope they were buying dog treats!). When I first saw him, he was resting his chin on the steering wheel, looking like a tired trucker, but he was keeping his eye on me as I approached his van. Clyde always has a colorful bandana-- he seems to have quite the wardrobe! 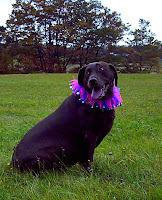 I hope we'll see Clyde and all his friends at the Cape Elizabeth Family Fun Day Dog Show on Saturday, June 11. The show starts at 1pm on the upper field. Register from 11 - 1pm-- It's free, it's fun, and the weather looks doggone good for the day! In balmy 50-degree temperatures, dozens of dogs and scores of people gathered to dedicate the polished granite bench installed in the off-leash area of Fort Williams to honor the memory of Ansel "Tup" Tupper, who died suddenly in August. It was very nice to see so many of the Tupper family here for the holidays, and for them to see us demonstate our affection and respect for "Tup". "Tupper #4", as he identified himself, read John Masefield's "I must go down to the Sea", and told us of how his dad was both a little ashamed and a little proud of Rambo's tendency toward mitten thievery. Playing with Rambo, the bigger than life labradoodle who looked just the right size next to Tup's tall frame, was how most of us came to know Tup, and I personally always knew it would be a good morning for Athena if Rambo was there. For a man who loved the sea, who could read the sky for a weather report, I think Tup would have loved the fact that Casco Bay was dotted with sailboats on January 1st. Janet Violette, who spear-headed the efforts that led to the bench's installation, leads the champagne toast. The bench was a very popular spot with all the dogs in attendance. Who Let the Dogs Out? Cape Elizabeth Family Fun Day! This is not Westminster-- all dogs are welcome, regardless of pedigree (don't ask, don't tell!) I hope we'll see you there! Every tribe has an elder, and there is no need for protocal or rules to determine who will hold this honored position. It is a natural instinct to respect those who have travelled much father than we have through life, and last week, I saw that it is true with dogs, as well as it is true with humans. As Athena shot like a bullet from the back seat of the car, like she does every day, she bounded onto the lush green field fresh from its winter rest (no seriously, they wouldn't let us touch it-- but it's worth it-- it's like a thick plush carpet!) toward what she initially thought was another chocolate lab. It turned out to be "Sagen" (named for the astronomer), a 15-year old labrador, visiting the park for a gentle mosey in the late morning sunshine. Sagen still had plenty of energy for tail wagging, and you could tell that he held his own in games of tag for many years, but he was wise enough to let the young pups handle the leg work while he "supervised". Athena and the other dogs were all respectfully gentle around Sagen, and the humans acted like they were meeting a celebrity! A 15-year old lab is indicitve of both good breeding, and excellent care by Sagen's people. I'm sure that many good walks contributed to him being able to enjoy a long and happy life-- and retiring in Cape Elizabeth-- what could be better? Athena lives in topsy-turvy world. Currently, she is on-leash in her own yard, but off-leash at the park. The allure of a neighbor's compost pile is making it difficult for her to remember the boundaries of her own yard, so we're working on that. Wandering on her part makes me very nervous. So I could imagine how another dog owner felt yesterday morning when an older yellow lab appeared in my yard around 5:30 am. I went outside to investigate, and found him to be cold and wet, but very friendly. He had a tag on his collar with a name and phone number in a neighboring town, so I introduced myself and invited "Packy" inside and dried him off and gave him some breakfast before calling the number on his tag. Athena was a little nervous about the sudden arrival, but seemed enthusiastic about welcoming a potential playmate. The phone number on the tag had been disconnected, so it turned out it wasn't going to be as easy to find Packy's home as I'd thought. I called our local police department, to inquire if someone had reported a dog missing, but no leads there. I called the next town over, as the tag indicated the owner lived in South Portland, but nothing there either. Then I turned to the internet. I did a reverse look-up for the phone number on the tag, and got the name on the tag with an address in South Portland. Google Maps gave me the directions, and even though I was pretty certain Packy could not have wandered so far and over so many busy streets to end up in my yard, we headed for the address. The "Beware of Dog" signs in the windows of the house at the address from the internet did not give me confidence. There was absolutely nothing to beware about Packy. He is a true-to-his-breed "be my best friend" labrador. As I knocked on the door, a fiesty dachsund was the reason for the sign, and luckily, the homeowner was up early. It was not, however, Packy's owner. He thought for a minute, and said he thought Packy must belong to the people who had lived there before him, and maybe he had a phone number for them. He gave me the number and I thanked him for his early morning help. I called the phone number on the slip of paper, and a man answered. I explained that I'd found a yellow lab. He gave me directions to his house, which in the end, was so close to our house that we'd passed it twice already in our search for Packy's home. Packy's owner was waiting outside when we pulled into the driveway, and Packy jumped out of the car and did the happy labrador dance-- you know the one: all wiggling and tail wagging. The owner explained that he'd let Packy out last night, and that every once in a while he wanders off. "Oh I know exactly what you mean", I replied. I'm sure Packy was lured by that same rotten compost pile. It is like the Sirens to the sailors in the Odyessy (or is it the Iliad...), or chocolate in the cupboard to me. 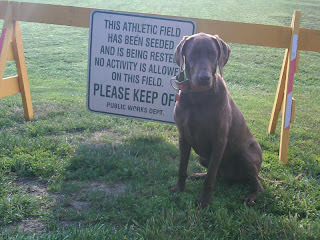 So our adventure had a happy ending, and in time for us to be at the park with Athena by 7am! . This is the time of year that I can't help but think about angels. 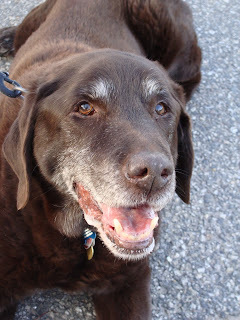 It was four years ago this week that I lost my Chocolate Lab, Angel. The day before she died was the first day she had not enthusiastically greeted me at the door, and while I thought it was unusual, even then she showed no signs of what was going on inside. By the next afternoon she was gone, too soon, too suddenly, and leaving my poor children with a mother who would burst into tears every time she came through the kitchen door without that lovely dog to greet her. She was my best friend. She was born on my birthday. My sister, with whom I also share a birthday, made the origami angel dog after Angel died, and it sits in a place of honor on my desk, just above my computer. Very few days go by that I don't think of Angel still. 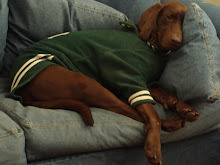 She was the puppy for my little girls, she was the listener who never tired of me, even through my divorce. She helped cushion the transition to our new house, and she had an unlimited capacity for snuggling. She was ready to jump in and enjoy swimming in the cellar the first time it flooded, the same way she was ready to jump into the ocean on the 4th of July (and on New Year's Day). She was the the best friend our bunny could have ever hoped for (even if she did ocassionaly swipe his carrot). She made us feel safe. Angel was partial to the Poor Farm Fields, another great off-leash area in Cape Elizabeth. She would fetch a ball, or preferably a soft frisbee, until my arm just couldn't fling it any more. She allowed us to dress her up in ridiculous costumes (the jester's collar pictured here was nothing compared to most Halloweens in her lifetime). So today, here's to all the great dogs who have shared our lives and left us a little heart-broken. The best thing they've taught us is to enjoy their company, because it makes our lives better every day that we do. I was born in Louisana some time around Hurricane Katrina. I came to Maine with a Rescue Organization, and I only miss home in the winter. I still don't like it when it rains. I have a very well trained owner, who takes me to the park almost every single day.